WARNING: This is not a classic best-of, this is not a classic CD full of known tracks. 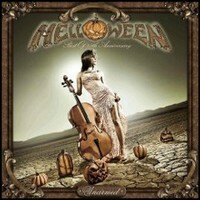 This is a special thing done by Helloween for their 25th anniversary. Why special??? This Unarmed presents classic Helloween track re-arrangend, re-played in new version.... An example is their new video Dr. Stein with tons of saxophones and a funky arrangement. Helloween always had a big sense of humor and this time they want to show us that, especially in their new version of Dr. Stein and Future World. This CD will sound very odd and particular to many metal fans, because in these track we can recognize the songs, but there is no metal inside. Personally I appreciate so much the long suite The Keeper's Trilogy with orchestration arrangements well done by Prague Philharmonic Orchestra, and other tracks like Eagle Fly Free will sound to your ears so particlar in acoustic or I Want Out with the intro done by a children choir!!! I appreciate the Helloween's idea to do something different, but they are (were?) a metal band, if they want to do something different, it's better not to put  their logo on this CD. My valutation is a 10 for their idea, and zero for what there's inside this optical disc. If you like metal there's a lot CD to buy, not this!!!! Ok! Back to business here, for those lovers of the old time Helloween this DVD is a treasure, Eagle Fly Free, Keeper Of The Seven Keys (yes, the complete song), A Tale That Wasn't Right, Future World, I Want Out, Dr. Stein and on the bonus DVD the monster song Halloween (yes, complete, again!) will do for the people that still cry for Michael Kiske (C'mon! He hates heavy metal, why do you miss him?). And for those who have grow up with this great band a lot of new classics, like Mr. Torture, If I Could Fly, Power, Hell Was Made In Heaven and a good repertoire of their last masterpiece starting with The King For A 1000 Years that opens the concert, The Invisible Man and Mrs. God and on the bonus DVD Occasion Avenue. As you can see, all of their long anthems are here with the exception of The Time Of The Oath, but the best of all, the band give us a great performance, they look happy again (something that haven't happen for a long time), Andi sings really great, and good old Weiki plays like never before! And the rest of the band gives us a show that takes you from a big laugh to the wildest headbanging in your seat! 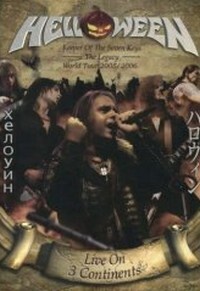 Maybe the option to change the cities will not be used by many (with the exception of the metalheads of Tokyo and Sofia (that's Japan and Bulgary, for those who didn't go to school), but this DVD gives to the band fans every they could ask, the bonus DVD also includes a long interview and a road movie (subtitles are avaible in English, Portuguese, Spanish and Czech, and the promo videos for Mrs. God and Light The Universe with the eternal fiancée of Mr. Ritchie Blackmore, Mrs. Candice Night. The Keeper Of The Seven Keys albums are classics and so I think it's not a good idea to revive this story, but Helloween decided to do a part 3 about 17 years after the release of Pt. II. With Mrs. God they will give the fans an appitizer. Musically they didn't go back to the late 80's, they stick more to their nowadays sound. If that's a wise decision, well, time will tell. 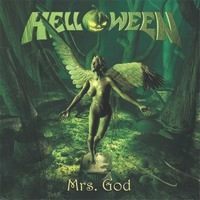 The track Mrs. God is catchy and has some of the typical sound elements of Helloween, but actually I think this one is too much pop. Even if Andy Deris tries to show a larger vocal range, his range is limited. He tries to add some aggressiveness which feels wrong in this song. As wrong as the sheep bleating. With My Life For One More Day they revive the old days a bit, but again the angry deep vocals of Deris and the scream don't fit to this up-tempo tune. Partly it seems that Deris wants to copy the screams of Hansen on the early releases, then a slower part with very melodic vocals. The melodic parts fit better to Andy Deris' voice and here are some reminiscences to the old Helloween, but the shadow of Michael Kiske is still too big. Better to go your own way. With Run theyput a non-album track on the single. A melodic rocker with the typical Helloween riffing, but ain't convincing. Andy Deris is a good singer when it comes to hard rock and melodic metal, but he lacks the power and doesn't have the range of Michael Kiske. He tries hard to expand his range, but doesn't succeed in my opinion. Actually I don't see that this album can one day be a classic like the Keeper Of The Seven Keys albums from the 80's. Sorry, I tried to see this impartial, but they can't convince me. I think that fans who like the last albums of Helloween will like this, but for fans who loved them in the 80's and have problems with these days Helloween, I think you'll be disappointed.